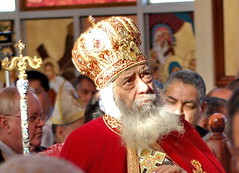 On Sunday, 14th November 2010 the Coptic Orthodox Church worldwide will celebrated the 39th Anniversary of the enthronement of His Holiness Pope Shenouda III as the 117th Pope of Alexandria and Patriarch of the Holy and Apostolic See of St. Mark. The unprecedented revival of the Coptic Church toward the second half of the 20th Century and the first decade of the 21st Century is one of the great historical events of world Christianity. This is directly due to the charismatic and dynamic leadership of His Holiness Pope Shenouda III, who has transformed the entire landscape of the Church.